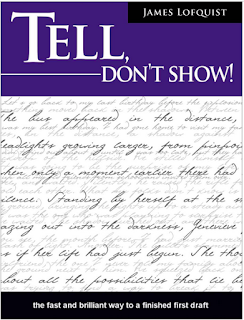 One of the most commonly-heard pieces of advice given to novice fiction writers is "Show, don't tell." We're told to show what's going on, what's important to our characters, what the characters are feeling, etc. Naturally, when I encountered James Lofquist's Tell, Don't Show! it caught my attention. How could he suggest doing the exact opposite of virtually every other writing instructor out there? As it turns out, he makes a great point. Lofquist suggests that both plotters and pantsers tend to write their first drafts in great detail, thinking carefully about word choice, dialogue, pacing, etc. This kind of writing can be very time-consuming. Worse, after spending all that time getting words "just right" we'll sometimes end up cutting entire scenes, pages, or chapters because they don't work. Perhaps worst of all, we might never complete that first draft because we spend too much time polishing it as we go. He suggests that a better approach is to write the first draft of the story in "telling" mode as much as possible. Use short statements, bulleted lists, etc., to capture what is happening in the scene. If good bits of description or dialogue happen to strike you as you do this, jot them down. If the right details don't come to you, insert placeholder statements like "They have an argument about the budget." The goal is to lay down the entire story as quickly as possible. You now have a "first draft" which is short on details but easy to read through and review. Fred comes home late. Jane confronts him. Fred's been out working a second job to earn money to buy an engagement ring, but doesn't want Jane to know this. Jane's been cheated on before, and believes Fred's late arrival is a sign that he's having an affair. If that's the case, she wants to end things sooner rather than later. "If you can't tell me where you've been," Jane says, "I can only assume the worst." Fred's got to convince her that he's not cheating on her, without spilling the beans about the ring. He decides to make up a white lie that he had a car problem and it took four hours to get the car running. The car's been acting up lately, so it'll be plausible. The actual scene written from these notes might be several paragraphs long, but the notes can be written down quickly and easily. This shorthand approach allows you to flesh out the entire story relatively quickly, in essence "pantsing" a first draft in minutes or hours. A big advantage to this approach is that high-level revision is much easier. Imagine that we want to layer in a bit of foreshadowing. We decide to show Jane rifling through Fred's desk to look for love letters or hotel receipts proving an affair. Later in the story, when Jane's thoroughly convinced Fred is having an affair, she'll rifle the desk again and find the receipt for an engagement ring. She'll wonder if the ring is for her or the other woman. Adding that bit of foreshadowing is as easy as dropping in a bullet like "Jane goes through Fred's desk, looking for evidence of an affair. Finds none." 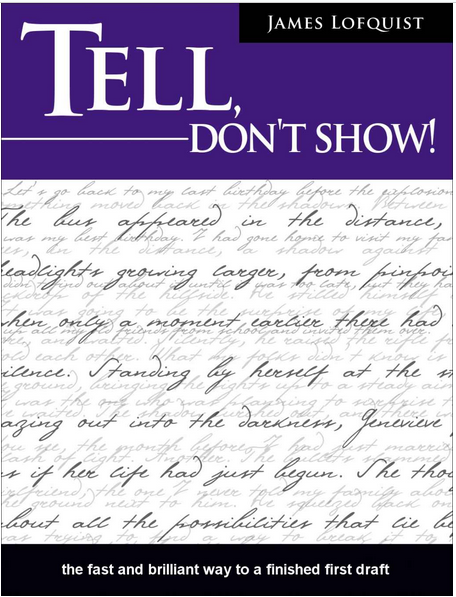 Once you've tightened up this "telling" draft of the story and feel that it's as good as it can be, you're ready to begin writing your "showing" draft. Now you can take the time to write clever dialogue, vivid description, and solid action. Having made a few passes over the "telling" draft, you'll have hopefully weeded out all the scenes that didn't work, peppered the notes with imagery, foreshadowing, etc., and be able to write a much stronger first full draft. This seems like a good way to get your first draft down on paper and quickly work through the first few passes of revision. I've done something similar in the past before reading this book, but didn't think to use this as a revision tool. I plan to try this with my next few stories and see how it goes.